The kids were hooked on the cinnamon-maple smell that overtook the kitchen in .5 seconds after taking it out of the oven. This is a kind of granola-ish, almost more moist cake-like fruit crumble. 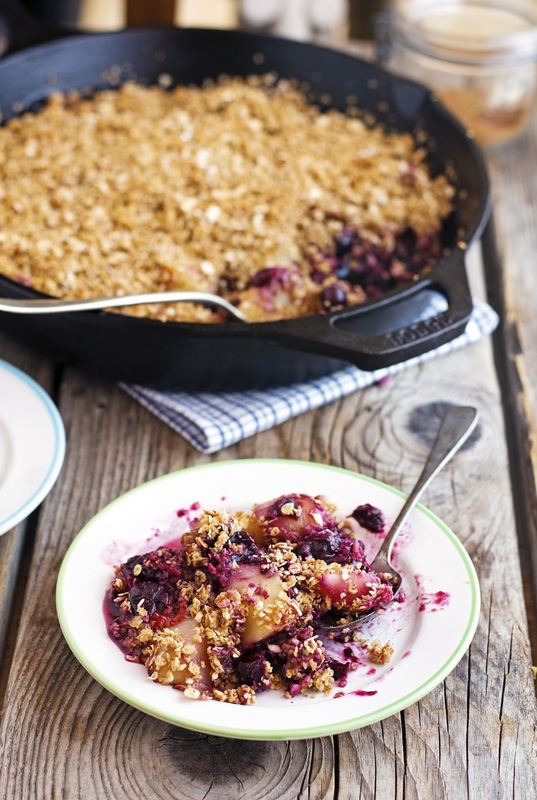 The top on this gets crispy, the fruit is extra sweet and soft, leaving you with this sticky, yummy, just juicy enough Maple Peach Blueberry Crumble. This is a wonderful summer dessert. You can make it with all different kinds of fruit, but peach and blueberry is my favorite combination. Fresh summer peaches and blueberries make the filling naturally sweet. Maple syrup and lemon juice make it awesome. The combination of oats, coconut oil, and maple syrup in the crumb crust tastes buttery — without any butter. 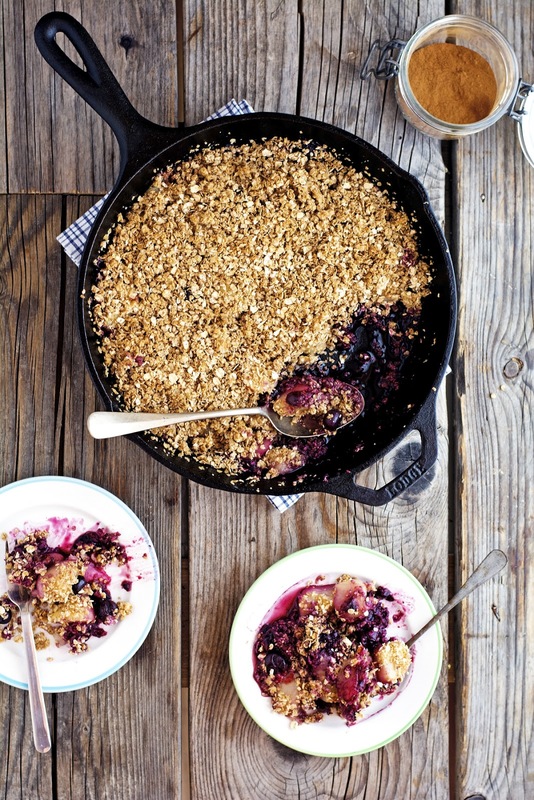 This crumble is naturally dairy-free, gluten-free, and refined sugar-free. Serve it with some Coconut Lemon Mousse or a scoop of Vanilla Ice-cream for an uh-mazing experience! 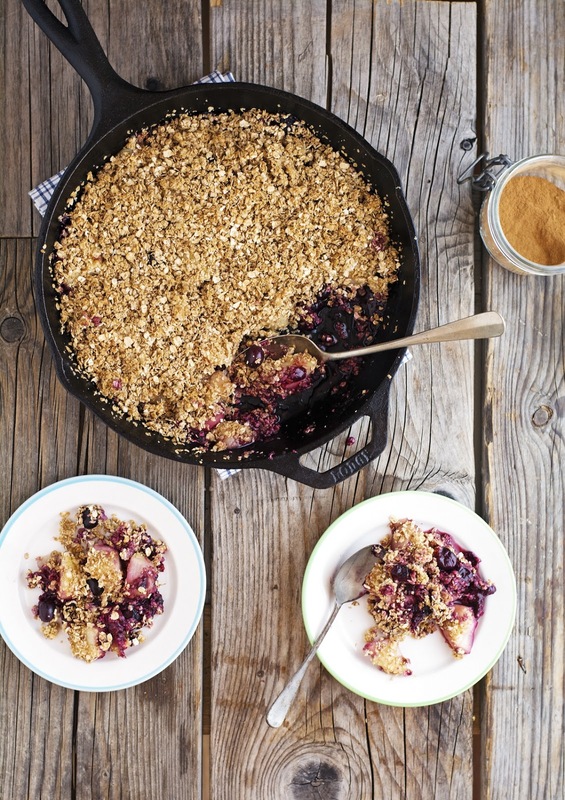 Maple Peach Blueberry Crumble (Vegan and Gluten-Free) Print this recipe! 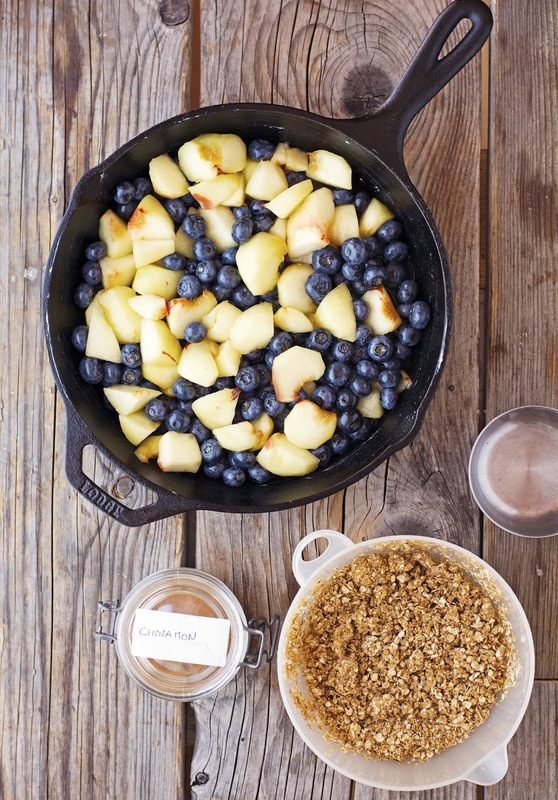 In a large bowl toss together peach chunks, blueberries, maple syrup, lemon juice, vanilla, cornstarch, and salt. Set aside. In another bowl mix oats, maple syrup, and ground cinnamon. Cut in the coconut oil using a pastry cutter or your hands until the mixture begins to form crumbs. Lightly grease a 9-inch diameter baking pan (or cast iron skillet or a 2-quart baking dish). Scrape the fruit mixture (with all the juices) into the baking pan. Spread the topping over the fruit in an even layer. Bake for 25 to 30 minutes, or until the topping is browned and the fruit is bubbling. Remove from the oven and allow to cool at least for 10 minutes before serving. One serving yields 161 calories, 5 grams of fat, 30 grams of carbs, and 2 grams of protein. It looks really delicious Mike! I love how colorful and so summery it is, I'm a big fan of fruit crumbles and you just made me think of making one myself this week...plus my blog needs more recipes like this one! Also it's a bonus point that this dessert is kids-approved, yay!